For a team that most predicted would be among the worst in the NFL this season, this isn’t a bad position to be: 1–1 entering a nationally televised Thursday night game. And again it will be former Michigan State quarterback Kirk Cousins who leads the Redskins out of the tunnel and onto the field at MetLife Stadium for their divisional showdown against the 0–2 Giants. With a win, Washington will have a chance to take a share of the lead in the decimated NFC East. The game will also mark Cousins's 12th NFL start, which is not a milestone of any sort, but in and of itself is sort of miraculous. Yes, here we are. After three tumultuous years as Robert Griffin III’s on-again off-again backup, three years of soap opera-level drama, head-scratching decisions, in-house fighting, anonymous media reports and, ultimately, fan desolation, Cousins is now the entrenched starter. (Well, until maybe he isn’t. But hold that thought). There is no denying that Cousins was Washington’s Plan B. If all had gone according to plan, he’d be the one with the clipboard in his hands this season. When he was drafted by the Redskins in the fourth round of the 2012 draft—the same draft in which Washington traded away four picks to select Griffin with the No. 2 pick—it was a confounding decision, to say the least. Cousins was thrust, by no fault of his own, into an unenviable situation. Best case scenario: Griffin becomes the transcendent player we all saw during his rookie season; Cousin never sees the field. Worst case? We’re looking at it: a three-year long contrived quarterback controversy that could have been avoided and, now, the desperate hope for the success of the contingency plan. Kirk Cousins has played this role before. When he was in the eighth grade, in 2002, he moved from Barrington, Ill. to Holland, Mich. and there he went with his father, Don, to visit the coach of the Holland Christian High football team. The problem: Holland High did not yet have a varsity football program, and Lont—who then coached the town’s eighth grade team—was initially not all too impressed with the kid who hoped to play quarterback for his not-yet-in-existence team. Cousins’s freshman year would end up being the first season Holland High fielded a varsity program. Still, it wasn’t until his junior year that Cousins was named Holland’s starter ... and then the unheralded, spindly, 180-pound quarterback promptly broke his ankle in the first quarter of their first game and missed most of the season. Cousins would have to wait yet another year for a real chance. During his senior year, fully recovered from his injury, Cousins threw for 1,893 yards and 26 touchdowns with a 57.5 % completion percentage and nine interceptions to lead the Maroons to a 7–3 record, marking their first winning season and their first state playoff appearance. After a postseason loss, Lont hoped Cousins would land at a MAC school—Northern Illinois, Western Michigan and Toledo had offered. But Cousins held off on signing early. Roundtable: Is there hope for Robert Griffin III's NFL future? That December, nearby Michigan State went through a coaching change: out went John L. Smith, in came Mark Dantonio. As a result, Keith Nichol, the top-ranked quarterback prospect in the state, reneged on his commitment to MSU and signed with Oklahoma. Dantonio was forced to go to Plan B, the little-known quarterback that assistant coach Dan Enos had watched play at a summer camp and became enamored with. The Spartans called Cousins on a Thursday, three weeks before National Signing Day, but the quarterback told him he had one last exam left; he’d have to call him back the next day. On Friday, Jan. 18, 2007, he verbally committed to Michigan State, as under-the-radar of a signing as a Big Ten school will ever see. In the NFL, the label of “game manager” is almost always used pejoratively. It’s a tag that many quarterbacks (see: Smith, Alex) will spend their entire careers trying to shed and one that offensive coordinators so often denounce. This is not the case in Washington. Low bar? Indeed. But that’s not to say the approach won’t work. With the Cowboys depleted by injuries (both Tony Romo and Dez Bryant will be out roughly eight weeks, and Jason Witten is dealing with knee and ankle issues), and the Eagles and Giants winless, seemingly splintering at the seams, there exists a narrow window of opportunity. Say it with me now: These Redskins could maybe, possibly, win the NFC East. With an offensive line and a stable of running backs dominating the way Washington’s have—leading the NFL in rushing at 171.5 yards per game, buoyed by rookie Matt Jones’s 6.04 yards per carry—it’s incumbent upon the Redskins’ quarterback to protect the ball. But then there’s this: Since 2011 Cousins has the highest interception percentage (4.5%) of any quarterback in the league. In a Week 1 loss to Miami, Cousins was the same Jekyll and Hyde passer critics denigrated in 2014, leading the team to an early 10–0 lead but also throwing two picks and totaling zero second half points. But last week, in a surprise win over the overhyped Rams, Cousins played the role his team has asked of him: game manager. Washington ran 66 plays in the latter game and racked up 182 yards on the ground. Cousins was 23 of 27 for 203 yards with one touchdown and, crucially, no interceptions. If anything, it was in his 12-play, 82-yard, second-quarter scoring drive where Cousins demonstrated exactly how he must play in order for this Redskins campaign to go well. In that drive he completed all five of his pass attempts, none traveling further than 10 yards in the air (including two on third down) and Washington ran the ball straight down the Rams’ throat. That drive lasted eight minutes, with a four-yard touchdown pass to Pierre Garcon to cap it off, and sent the Redskins into halftime with a 17–0 lead that would prove insurmountable. The downside of being a game manager—of not being given free reign to air it out—is you are always one game away from not being the game manager; from, say, Colt McCoy taking your job. What’s to say McCoy can’t be a game manager, too? How does Cousins handle that pressure, with coach Jay Gruden's quick trigger-finger being so well-documented, with his own status in Washington constantly up in the air? Dave Warner first met Cousins during the QB’s (very late) official visit to Michigan State in January 2007, and in that meeting Cousins did something the Spartans’ quarterbacks coach had never seen a recruit do in all his years coaching. When they sat down to talk about quarterbacking, Cousins pulled out his notebook and began taking notes. “That’s just who he is, how he goes about his business,” Warner says. Warner says that Cousins struggled early on in his MSU career and was behind fellow freshman Nick Foles (the Rams QB he beat just last week) on the depth chart. Then, in Cousins's sophomore year, after Foles transferred to Arizona and everything seemed to be going in Cousins's favor, that’s when Keith Nichol came back into the picture. The old Spartans recruit had transferred from Oklahoma to Michigan State, suddenly starting a quarterback controversy in East Lansing. 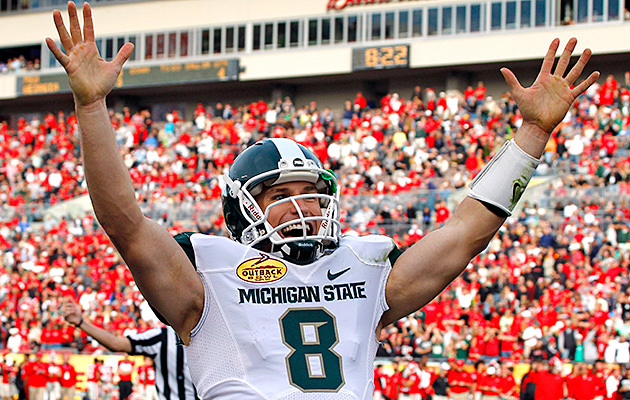 That all worked out pretty well for Michigan State, Cousins became the only three-year captain in the program’s history, finishing his career as the team’s all-time record-holder in passing touchdowns, total offense and wins, and leading the team to a share of the Big Ten championship for the first time since 1990.